And now for something completely different! 50049 Defiance works the 6F50 09:08 Cardiff Canton to Kidderminster past Broken Cross (near Gloucester) on 29 March 2012. 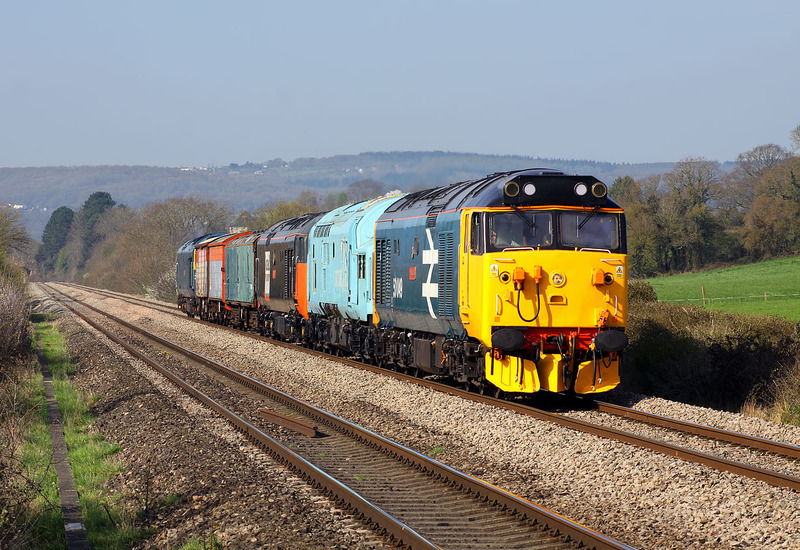 The train comprises partially restored 37308, 50135 Ark Royal & 50044 Exeter. The inclusion of a van and a couple of wagons makes it seem a bit more like a real train, rather than a loco convoy. This highly colourful combination could easily be seen approaching across the open countryside. Not only is 37308's light blue 'livery' startling, but it was made more obvious by tatty plastic sheeting around the roof fan, that was flapping around in the slipstream! 50135 and the wagons were dropped of at the Severn Valley Railway, leaving the thee locos to continue on to Derby RTC as 0M50. 37308 was then detached, and the two remaining 50s worked back to Kidderminster as 0V50.